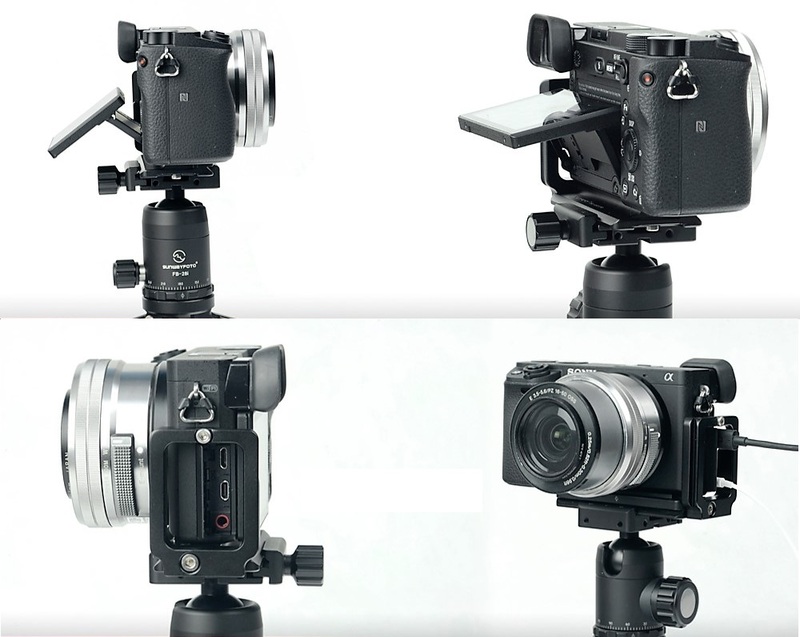 Sunwfayfoto has released for quite some time now, an Arca-Swiss® compatible Quick Release Modular L Bracket dedicated to the newest addition to the SONY® APS-C interchangeable lens mirror-less camera family, the a6300. The new PSL-A6300 L bracket is very similar in design to the one targeted for the a6000, the PSL-A6000R (preview), which somehow at first glance look identical but actually differ in many details from each other. Further, although the model name now lacks the letter "R" at the end, compatibility with the RRS® Lever Release Clamps is maintained as a standard feature. 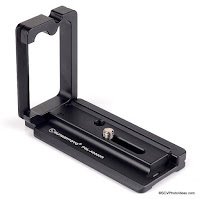 Needless to remind the readers that as all Sunwayfoto products the Sunwayfoto PSL-A63000 is CNC machined from aircraft grade aluminium and hard coat anodized in satin black. 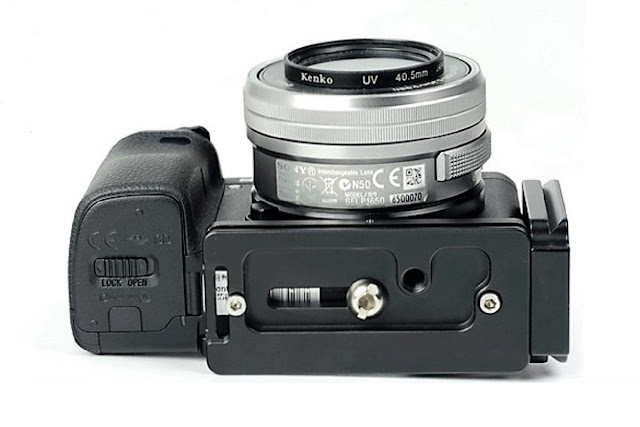 The base plate of the PSL-A63000 is almost identical to the former PSL-A600R and relies on a ridge running across its front side preventing twisting. The off center pod mounting hole with 1/4"-20 thread and a strap loop on the open end of the base plate are still there. Same as the mounting screw captive slot which runs 23 mm long, enables the L bracket to be pulled away from the camera side for use of longer plugs in the camera side connectors. Sunwayfoto PSL-A6300 L bracket seems almost identical to the earlier PSL-A600R. Much like most of Sunwayfoto L brackets for SONY the PSL-A6300 sports aligned base plate and vertical side plate dovetails. A fact, which combined with center Φ marks on both plains proves very convenient in changing from horizontal to vertical orientations since no correction in framing will be needed whatsoever. Sunwayfoto PSL-A6300 L bracket front view with the prominent Φ lens centering marks. The PSL-A6300 vertical plate is attached on the base plate via a single screw, which makes it very easy to be removed anytime, using one the included Allen hex key. The vertical plate has a threaded hole on one end, where one of the safety stop screws may be installed . Further, there is a cut on the top left corner of the vertical plate making it thinner so as to allow for the side connector flaps to be opened while the bracket sits flush against the camera side. Sunwayfoto PSL-A6300 L bracket can easily be split into a base and a vertical plate anytime. The bottom side of the base plate stops just before the battery door allowing for easy access and is hollowed out making the structure lighter. The usual two safety stop screws holes are there allowing for two M3 screws to be installed at either end of the base plate. The bottom side of the base plate is hollowed out which together with its short length make the structure lighter. Sunwayfoto PSL-A6300 allows unobtrusive tilting of the LCD screen as well as full access to the side connectors. 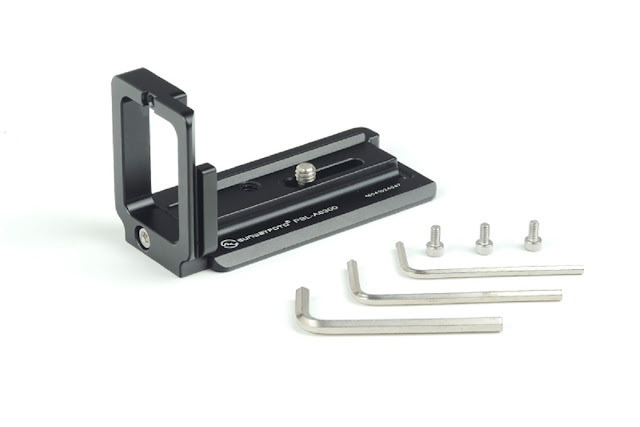 In accord to the Sunwayfoto standard, the PSL-A6300 is accompanied by three M3 safety stop screws and three Allen hex wrenches, appropriately sized for the 1/4"-20 mounting screw, the M4 hex socket side screw and the M3 screws. Sunwayfoto PSL-A6300 L bracket with accompanying stainless steel hardware. According to Sunwayfoto, the latest PSL-A6300 L Bracket is also backward compatible with the previous SONY model the A6000 ILC camera. Expected retail price for the PSL-A6300 L Bracket is US$ 44.95 (+Free Shipping in the US) and is not available in the US but from eBay in the rest of the world.